Laboratory Services - AirNova, Inc.
AirNova, Inc. offers a variety of laboratory services designed specifically for the air pollution industry. In addition to the mobile laboratory services offered, chemical analyses specific to stationary source, industrial hygiene, and ambient air testing are performed in our analytical laboratory at the AirNova facility. 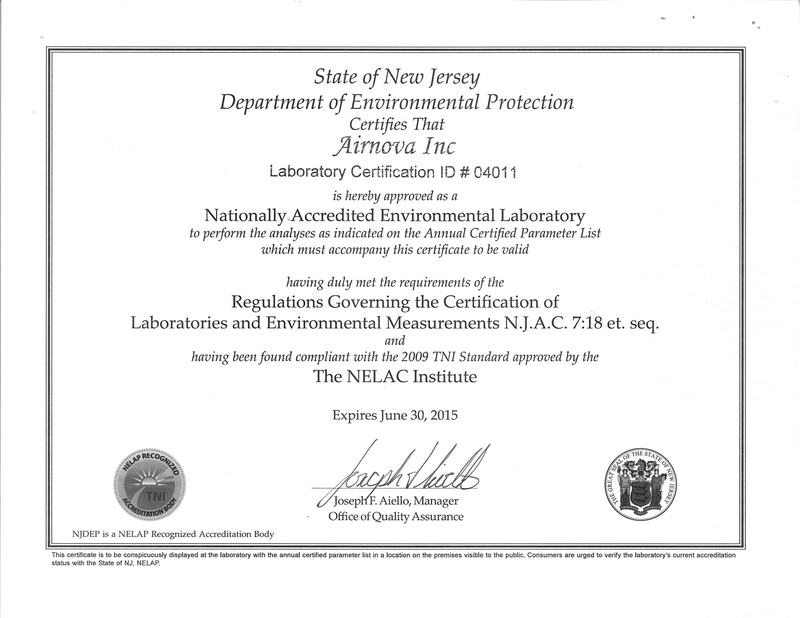 Recognizing stringent QA/QC procedures inherent in stationary source methodology that are significantly different from those of water and soil analysis, AirNova operates it’s NELAC Certified Laboratory with the intention of providing consistent, high quality analytical data for the often complex sample matrices unique to air sampling. 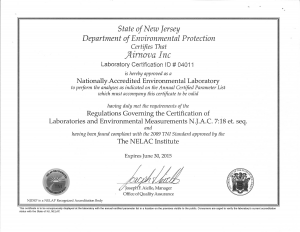 Primary certification is in NJ with additional certifications from NY, Virginia and Pennsylvania. Laboratory capabilities include gas chromatography with FID, FPD, and TCD detectors; ion chromatography; high performance liquid chromatography with UV and fluorescent detectors; and a variety of particulate and wet chemistry techniques. Particulate analysis (including back half sample train evaluations such as EPA Method 202). Methods include EPA 5, 5B, 5D, 5F, 17, 201, 201A and NJ ATM1. Lab and field GC analysis such as EPA Methods 15,16,18 and 308 for specific VOC’s including methane, ethane, methanol and sulfur compounds. Analytical techniques include direct aqueous injection. Instrumental response factor determinations for VOC mixtures and calibration standards. Additional methodology includes CARB, OSHA, NIOSH, ASTM, and EPRI standards. Annual proficiency samples are analyzed as part of the national Clean Air Proficiency Test (PT) Study. Also, the laboratory electively participated in the organics portion of the Industrial Hygiene Proficiency Analytical Testing (IHPAT) Program offered through AIHA. When requested, AirNova, Inc. analyzes blind samples received from federal and state agencies during compliance testing. These routinely include sulfur oxide, chloride, dioxins/furans, toxic metals, and both EPA Method 18 and 25 audits when available. Our reputation in the air services industry makes us a valuable source to other testing firms who use our analytical laboratory services regularly and on-site stack sampling services when confronted with scheduling difficulties or large projects. Please feel free to request information on any of our services.